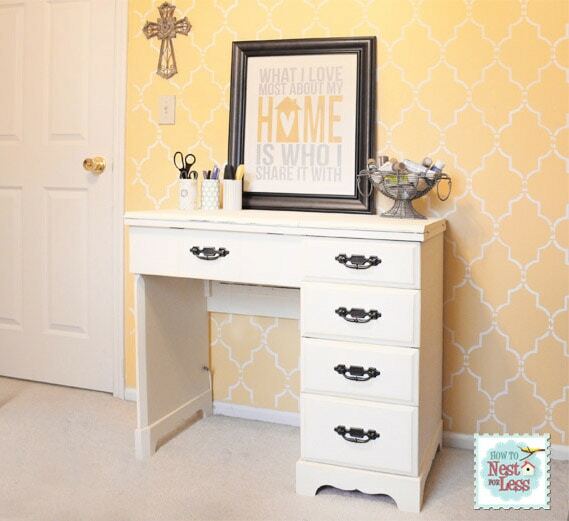 I knew I was going to put this sewing desk in my craft room/home office. Ya know, the one with the stenciled yellow walls? 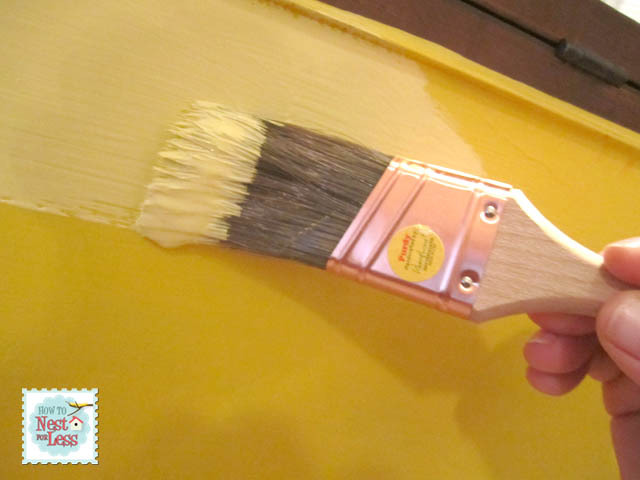 But rather than just painting the sewing desk plain white, I decided to play off the yellow walls a bit. So I removed all the hardware and got to work! 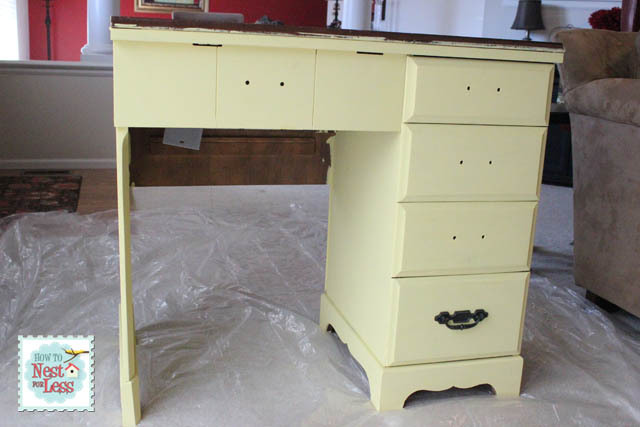 To start off I used my Purdy paint brush to give the entire desk a coat of Canary Yellow latex paint from Krylon mixed with a bit of Old White Annie Sloan Chalk Paint (it was the only white paint I had on hand so this was a complete experiment which seemed to work pretty well). I painted everything EXCEPT the top of the desk. I didn’t worry about getting the coverage absolutely perfect since I had a plan for the final look. Next I coated the entire desk in two coats of Old White Annie Sloan Chalk Paint, including the untouched top. 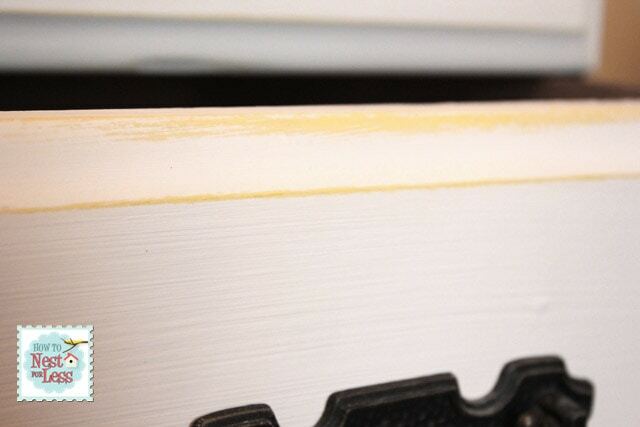 and then everywhere I had painted yellow on the desk first had this beautiful color peeking through! So, what do you think of the final sewing desk? I kept the original hardware, just cleaned it up a bit! I love how it looks against the white paint. And TADA! Here’s the sewing machine! Yeah… like I said, I don’t know how to sew in the least. BUT it was one of my New Year’s resolutions so goshdarnit I’m going to learn! I don’t need anything fancy as a beginner so this sewing machine will suit me just fine. Wish me luck! 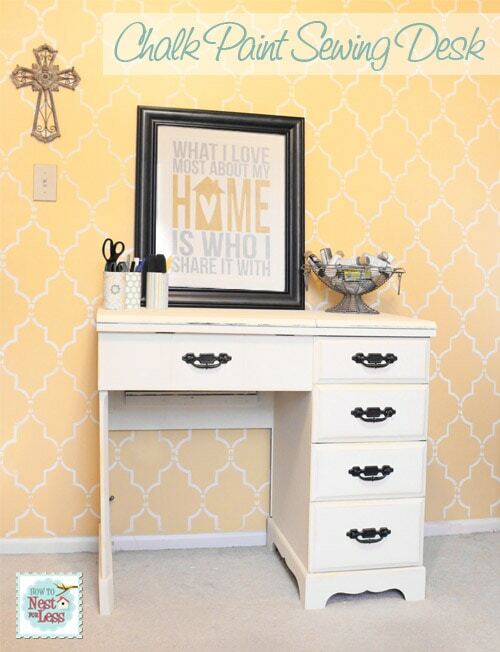 Your desk turned out SO well! 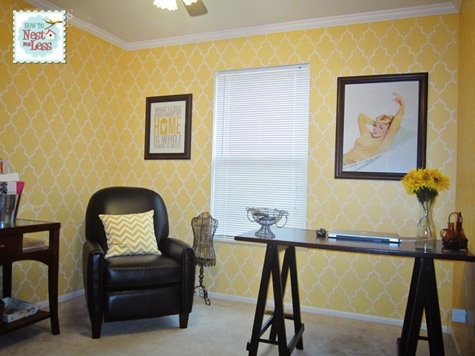 I bet it is a totally different experience sewing at your newly “prettified” desk! I’m not sure if “prettified” is a real word, but it seems to work here! Have a good one! Thanks! I’m pretty stoked about learning to sew. I’m so LOST right now, but hoping to find some lessons on Pinterest! Go over to Craftsy.com for video sewing lessons by real experts. Erin this looks fantastic! 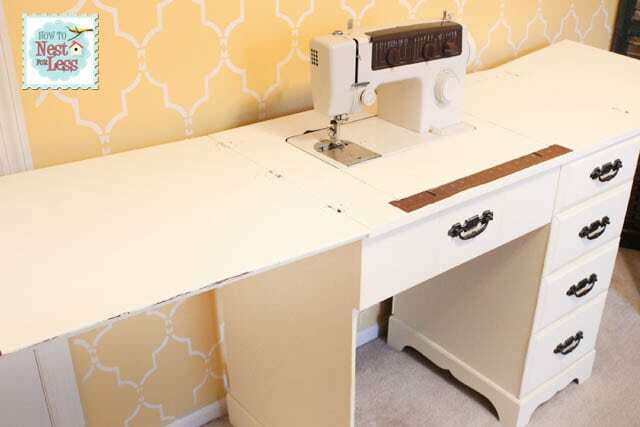 I have sewing desk envy right now-my craft/sewing desk consists of a fold out table from Costco 🙁 I love the color and it goes with your room perfectly! The desk turned out so cute and I LOVE your room! That looks exactly like the one my mother-in-law gave me. I don’t know how to sew either and hopefully, this year I will learn. I never thought of painting it, but it’s definitely on my To Do list now. I think we should learn to sew together. I have no idea how, but my mother-in-law gave me an old one to practice on. I’m too intimidated to open it! @ Bri & Erin! ~ Ladies what are you waiting for? I’ve got 2 sewing machines now. my Dad had bought my Aunt’s very old model Singer 404 that she used to use in making quilts. I used that one till it broke down on me one day, had to go out & buy another ‘newer’ model Singer 6235. In school we had to take a sewing class for ‘Home Economics’ but back then I wasn’t really interested in it. Only when I was pregnant with my son, did my interest for sewing peak again. My mom & I made maternity smocks, etc. I made various outfits for my son & then later when I had my daughter, I made her Baptismal gown & cap. That was a lot of fun! Sewing is another one of my passions that I use as a sanity outlet! You two have fun when you finally “open” up those machines. LOVE it! 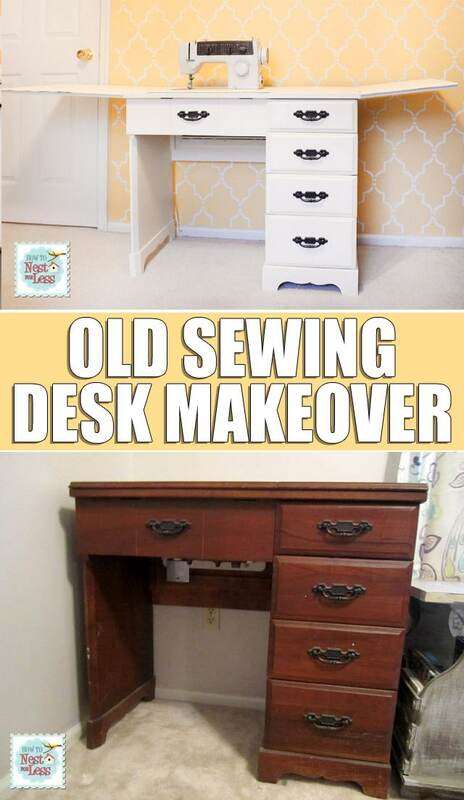 And that sewing desk is a dream! Hang on to it! They don’t make them like that anymore. You should definitely learn to sew…it’s tons of fun and the possibilities are endless! Thanks Marie! I’m definitely going to try and learn! I just need to find a cool project to start with!! You did a wonderful job. I love the soft yellow. 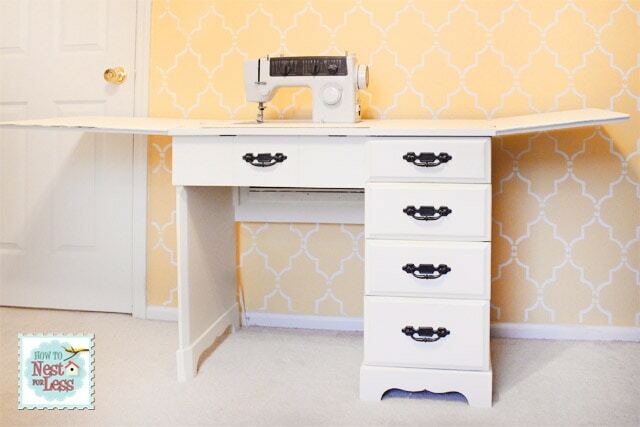 What a dreamy sewing table to learn to sew on! You will be making some beautiful creations! The sewing desk looks lovely. I don’t have one. I have to open and close my machine each time I use it and sit it on a table or desk. I have sewn for year and years. I used to make everything, but stopped years ago when material became too expensive. Now I buy remnants and sometimes copy something I absolutely cannot afford. But sewing is relatively easy if you follow the directions to the letter. At times, they might not appear to make sense, but they. I once spent a whole night saying this will not work. Finally, I just went ahead and did what it said. The dress I was making turned out beautiful. I loved it. What a gorgeous room! The desk looks great along with everything else! It’s so fun & cheery in there! Thank you so much, Mrs. Delightful 🙂 Heading over to your place now! Thanks Lynette! I can’t wait to get started 🙂 Now it’s just finding the time!! Oh my gosh Erin!! You did such a fantastic job!!! It looks like it’s meant to be in your craft room!! I have an old sewing machine too… you’ve totally inspired me! Would you PLEASE link this up on my blog? Great job. It looks so fresh and pretty now. Like a brand new piece. I love the yellow showing through! Good luck with the sewing, too! 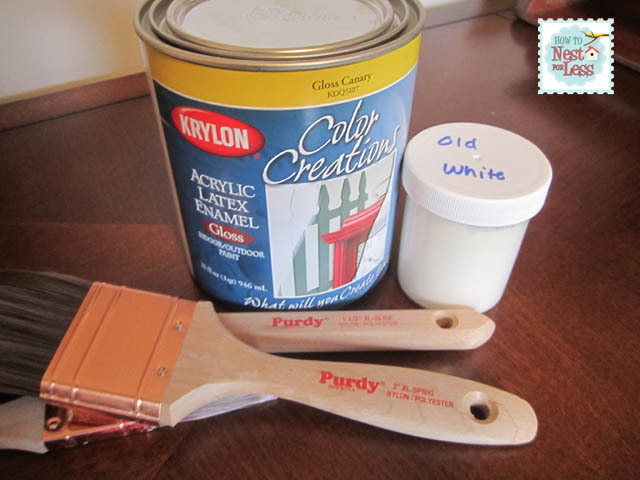 This is the fourth project I have seen today painted with chalk paint! I guess I better get on the ball! It turned out gorgeous! I am hosting my first link party today, and would love for you to add this along with anything else you like! The desk turned out so cute! 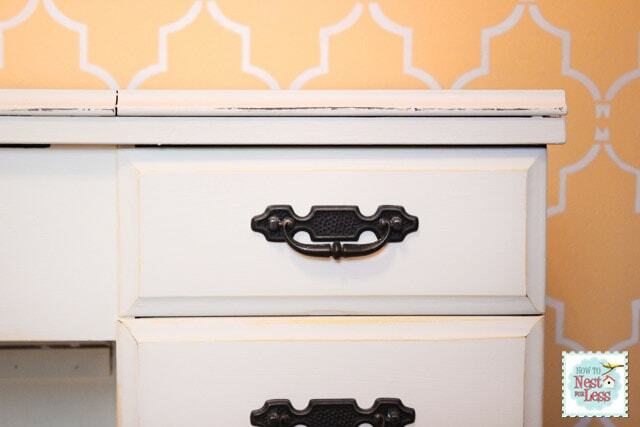 And I love the stenciled walls! What a great transformation! My grandmother just gave me her old sewing cabinet and I want to refinish it… this just turned out so great! PS- I’ve started a Blog Hop- would love for you to stop by and join in. Thanks so much Melissa! I’m heading over now! oh my gosh what beautiful work!!! 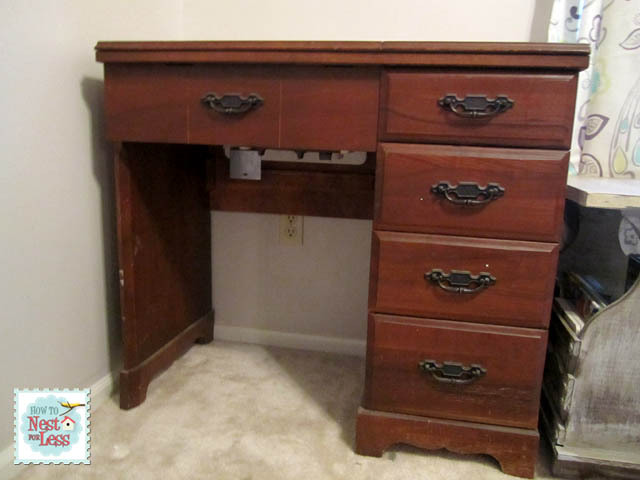 my gram had a desk like this… I wish I knew where it is now! So Lovely! GREAT room and it will be the perfect area to be crafty in! What a fun makeover! I love seeing the hints of yellow beneath the white. A great way to finish off a beautiful room. Question: Where did you get your “what i love most about my home is who i share it with” sign/print? The sewing machine cabinet looks great. I wish I had a cabinet like that. I love the drawers on the side to keep stuff in reach. Did you wax the piece after you were done? Thanks Mary! I ended up doing a clear wax over the entire sewing table. What a great turnout! This is beautiful. I love how soft the yellow looks peeking through. You did a fantastic job. Thanks so much for sharing with us. I’m working on some furiture transformations myself right now. I hope they turn out as nice as yours! Wish me luck! Hi Erin! I loved what you did with the sewing desk that you inherited. I also have a wooden sewing desk that came with the old Singer 404 model sewing machine that my Dad had bought off my Uncle many years ago. My Dad had bought the machine & table for me after my Aunt had passed away. I think my sewing desk is way older than yours is, because even the drawer pulls are made out of wood. I think I will have to put “refinishing” my sewing desk on my list of “DIY projects. Mine opens up like yours does, except the pins to hold the machine on the inside are broken, so my machine just sits on top of the sewing desk. I’m planning to do something very similar (color under white) so it’s great to see this! Hi! 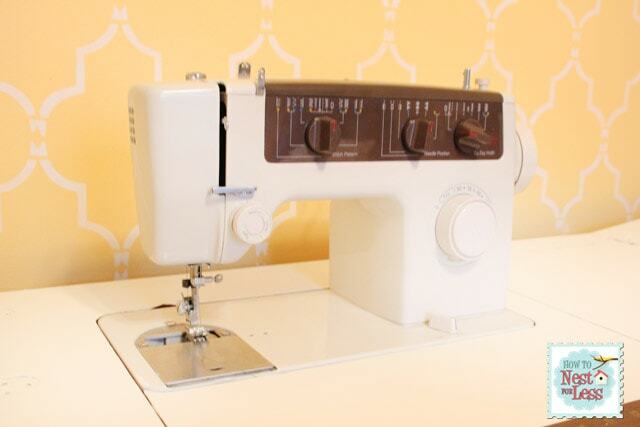 Was that the original sewing machine that came with that table or did you buy a new one? 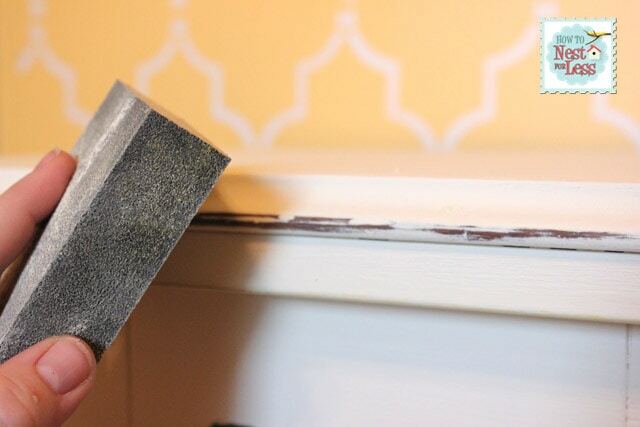 Hi I wanted ask if you used a wax over the chalk paint. I have an old sewing cabinet that i want to use chalk paint and a dark wax on but not sure how well it will hold up to use so just curious. It depends. Sometimes I like the chippy look so I don’t wax. If I want it more durable, then I definitely wax. 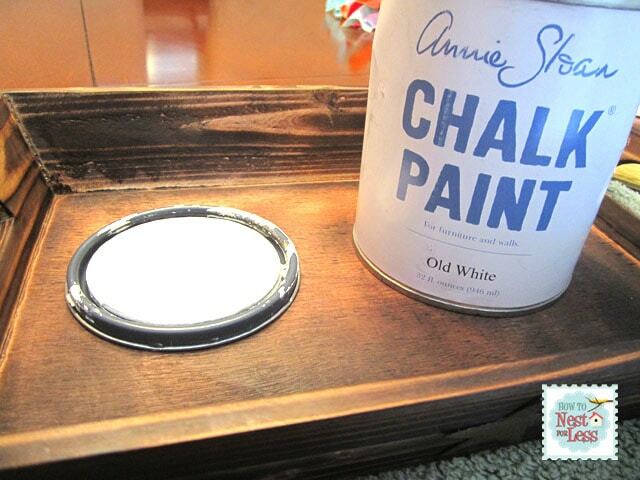 I’ve also found that Belle Craie brand of chalk paint wears a little better than Annie Sloan chalk paint. Hope that helps!